Around 2 pm yesterday, I was so cold I could hardly stand it. The weather has been wacky here in the Northeast: unseasonably warm, then cold, then warm again, then REALLY cold. I think the fluctuation has made it seem colder than it actually is. I’m not normally one to yammer on about the weather; just setting up the story here. A less lazy person would have found a sweater or turned up the heat, but not me. I suddenly had a memory of Mom Mom drinking hot water. Just plain hot water. Even as a child, that seemed…I don’t know? Odd? Wrong? Icky? “Depression Era” wasn’t in my vocabulary back then, although I suppose a part of me felt like drinking plain hot water with nothing else in it was probably a poor person’s drink. But it was 2:00 pm and coffee was out of the question for me. Tea didn’t sound good, either, since I am trying to cut back on sugar. So that left me with the obvious choice: Hot water, straight up, Mom Mom style! I heated up my electric tea kettle and poured the water into one of my rarely used (but oh so cute) Fiestaware tea cups. The hot water instantly warmed me. Not only did it warm me, it soothed me. It felt good. It felt right. I should have known Mom Mom knew what she was doing. Mom Mom wasn’t a doctor, but she was certainly ahead of her time when it came to alternative health practices, and most of her information was from AM talk-radio show doctors she listened to religiously. She and Pop Pop took vitamins and supplements years before anyone else I knew. I can still picture all the vitamins lined up like little soldiers at her kitchen table: small ones, big ones, clear ones, dark ones…so, so many! I hesitate to repeat any medical claims, but if you Google “benefits of drinking hot water,” you will find dozens of reasons to give this a try. It is important to note that you should never drink hot water straight from the tap, as it is not properly purified. Boil the water first, and then enjoy. If nothing else, it’s a nice post-holiday detox. This is only my second day, so I can’t share any life-changing claims just yet, but I promise to keep you posted on any progress worth noting. Bring to full boil. 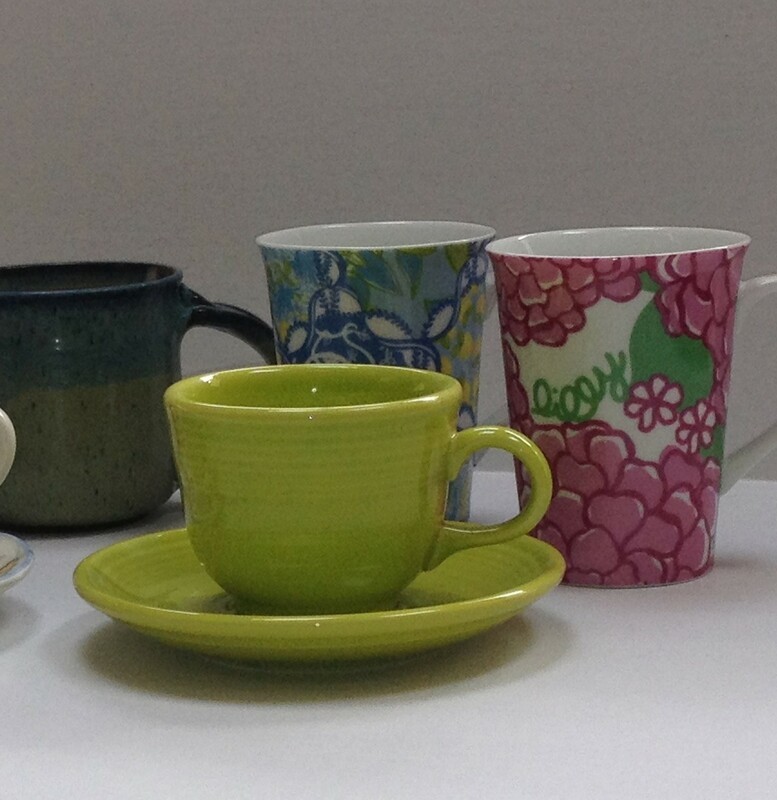 Enjoy in a mug or cute tea cup. This entry was posted in Beverage, Life and tagged benefits of drinking hot water, electric tea kettle, tea cups by Mom Mom's Apron. Bookmark the permalink. I drink cold water from the tap…what is the difference between that and hot water from the tap other than it isn’t boiling hot? Claire, I think hot water that comes from the tap may have impurities from the hot water heater. I have just always heard it was safer to boil. Ah…never thought of that…and I generally do get my cold water from the door of the freezer that is filtered and not out of the tap…I just thought of that too. We add lemon and honey for ailments! Sometimes fresh Ginger. Honestly, I thought you were nuts when I read this. I’ve changed my mind now. I’m hooked on hot water. Thank you, dearie. I shall have my next cup in your honor.